I hope the New Year is off to a good start for everyone! I did not stay up until midnight, I haven’t made it up that late in so long I can’t remember when last I did. This morning person has to have a darn good reason to be up that late and since parties and other sorts of gatherings aren’t my thing, there was no reason to not read in bed and go to sleep as usual. However, BookerTalk is a curious person and wanted to know what reading was winding down 2015, so to satisfy her nosiness, I read The Small Heart of Things: being at home in a beckoning world by Julian Hoffman. It is a lovely, quiet book full of observations of the natural world and humans in it. Today though, today, let’s talk about 2016. For the last couple of years I haven’t had any reading goals. This year though, I think it is time. Oh it is nothing so lofty as reading more classics or finally getting around to reading particular authors. No, it has to do with my reading table and all the books that are piled on it. Some of those books have been there for two or three years. This table is meant for books in progress or books to read next and it has become clear that in progress and next are ideas that have gotten extremely wobbly and imprecise in my vocabulary. Therefore, it is time to clear the decks, or rather, the table. I am growing weary of Bookman’s jokes that he is worried about it collapsing. But if you think I am going to go through and list every single book that is on that table in the post for your edification, you have another thing coming! As the year progresses I will definitely make updates so you don’t have to worry, you’ll find out what is on the table as I do because, big reveal, I don’t even know all the books that are piled up on it! Surprises for everyone! And of course there will be non-bookish Sunday posts to look forward to as well. Chickens ahoy! Biking adventures! Chills and thrills! You just never know what might happen. Oh, and then there is Vocalis too. I had better get working on my next essay. I already have the title: The Joy of Socks. Do you like it? I wonder what it’s about? Really nice new years post. Happy New Year, Stefanie! I hope you are able to clear off some of those books on your reading table this year 🙂 I don’t even want to think of how long I’ve had some shelf-sitters. Maybe it’s time to let some go but it’s so hard isn’t it? Here’s to a great year! Happy New Year Iliana! I hope I can clear off some books too. Once I get through a few library books I should be able to think about that table. I don;t even want to talk about books that are on shelves that I haven’t read yet! That’s for another year! Happy New Year. I’m doing a similar thing this year but instead of ‘reading the table’, I’m ‘reading the dusty stacks next to my bed’! Thanks Laila! Happy New Year! Happy new year, Stefanie! I hope to clear my “reading shelves” this year! Happy New Year Selina! Good luck with clearing your reading shelves! hey ..if you ladies do start on Proust, let me know..I need support to read him …will join you two! Like Arti, said, you will have plenty of time to catch up! Swan’s Way read pretty fast and is really good. In the Budding Grove is also quite good and paced really well. Guermantes Way, the third book is slow and drags and we’ve been reading it for over a year already. this is actually my second attempt to read it. The first time I abandoned it about a third of the way through! Arti, Yes! Proust is actually on the table which means I have to read him! So count me in! Awesome goals Stefanie…I love Bookman’s joke! Do let us know how the reading goal progresses! Happy Reading! Julian Hoffman’s book very much on my radar for this year. My pile of books to be read has become a set of shelves! Anthony, I’m just ignoring the shelves to focus on the pile on the table. The shelves are for another year! 😉 Hoffman’s book is good, I am enjoying it immensely. Wait, I thought that was what tables were for! Both tables in the living room are stacked so high with books, especially one table, that when we turn on the light, it looks like it’s in a small, illuminated cave. Ditto with my bedside table and, uh, all the other tables in the house. Ooh, I missed that you’d gotten the essay site up and running. I’ll take a look. I’ve been noodling around on a couple of things that aren’t ready for sharing, but once they’re ready, I’ll send them your way. Happy New Year! Your first book sounds like an excellent choice! I’m not making any big resolutions this year but am hoping to post and comment more often this year to keep my book blog from limping along the way it’s been lately! We don’t stay up in this household either. We are definitely a morning family and would be asleep on the sofa if we hadn’t gone to bed by ten. You cannot go against nature. Alex, I am in total agreement that you can’t go against nature. I can;t tell you how relieved I am that I married someone who is also a morning person. That sounds like a wonderful new year resolution. And the fact that you don’t even know what books are there opens a door of many possibilities. But I agree. I have a feeling 2016 is going to be a good year. Raney, Thanks! We’ll see if I can manage to not be distracted by new and shiny 🙂 Happy 2016! I too am reading a lot of my own books, so that I can clear the shelves for new ones. Like you, I’ve got books that I haven’t read that have been there for years. Good luck with your endeavor. Oh dear, I have a reading table too, just like that. The books I really think I;m going to squeeze in next between the bookgroup books, the review books, and sundry other bits and pieces BUT like yours some of them have been there for over a year now. I shuffled them around a couple of days ago and put three on top – there, they’re really the next ones I told myself but hmmm … I will try to note if and when I read them so you will know…As for the Joy of Socks. Sounds great to me. I LERVE socks. Deepika, you and me both! 😉 And thanks for the encouragement regarding the socks essay. I hope to post it tonight. Happy 2016 to you! I have similar Read My Own Books goals this year too. I have piles of “books to read immediately” in multiple places in my apartment, and some of them have been there for years. Good luck on your reading goals! Happy New Year! 🙂 Shelves? 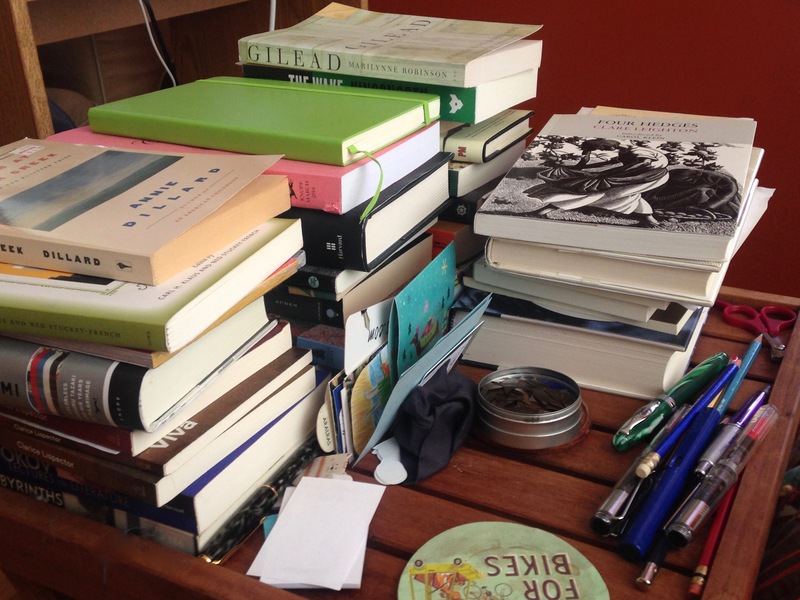 No, stacks are preferable for those you intend to read–stacks on any surface and on the floor! So much more accessible. nikki, thanks! I envy you the progress you are already making. I seem to be going backward, I just added three books to the table! Well, it’s about time that you owned up to the state of that night table. Now I don’t feel so alone, though I must say mine is looking pretty tidy all of a sudden next to yours! 😉 Good luck–I’ll be rooting for you and likely mine will be in just the same state soon enough…..
Joy of socks!! I’m at the office with stocking and I long for some warm socks! You got me intrigued! smithereens, heh, I hope your feet have warmed up! The essay should be up tonight if all goes well. Happy 2016. That is one mean looking reading table! I quite like a nice busy looking reading table! I’m also considering making a book list for 2016. I have a lists I’ll be selecting from, some on the shelf that I have been wanting to read “some day”, and the others that spark my imagination along the way.